The Distillery is an award winning high energy bar and restaurant that offers fantastic ambiance and hospitality for any drinking and dining occasion whether it's business, pleasure or a celebration. 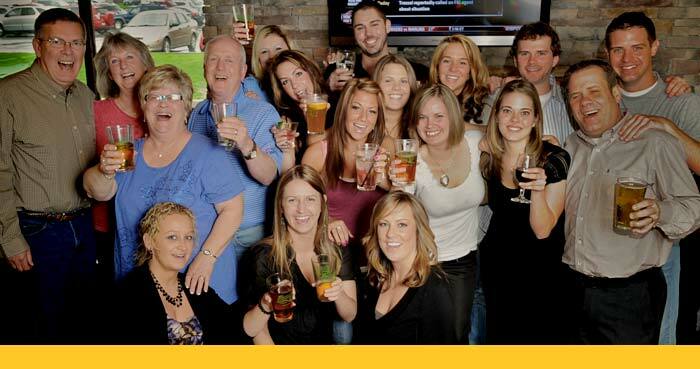 We offer a distinct selection of domestic, local and craft beers, seasonal rotating taps, a unique bottled beer selection, craft cocktails and an outstanding and diverse menu of American fare! In addition, you’ll find High Definition televisions showcasing the day's news and non-stop sports viewing entertainment, a state-of-the-art audio system featuring a rich selection of classic rock, country and current hit music, ensuring an exceptional guest experience every time!! 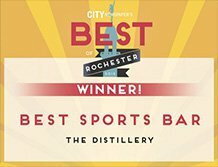 The Distillery opened the original location on Mt Hope Avenue in Rochester, New York in 1980 and quickly became a favorite spot for locals who met over good food and cold beer to discuss the various events of the day, catch up with friends, make new acquaintances and celebrate life! The Distillery Restaurant features a prominent center island bar which is the focal point of the operation. It is outfitted with a generous assortment of tap handles, ranging from classic lagers to more distinct ales and pilsners, which are maintained at a constant 34-degree temperature, keeping the beer consistently fresh and perfectly chilled for every glass served. Guests can sip their favorite draft beer from the popular pint, tall or the classic chalice. In addition to the extensive draft beer selection, freshly prepared food and outstanding service, which is the foundation of our commitment to excellence, guests choose from our superb beverages, which includes a fine selection of wines, martinis and specialty drinks. We continuously strive to create a great ambiance with timeless quality, friendly service and great food. We believe in attention to detail and are constantly re-investing to ensure our premises are maintained to a high standard and are extremely proud of our staff and management teams and know they work very hard to make your visit truly enjoyable. Our atmosphere is fun and wholesome, one you'll feel comfortable bringing your family and friends to seven days a week. Dine inside or when the weather’s nice, out on our spacious deck/patio ~ so come and enjoy. The Distillery, Your Neighborhood Gathering Place®. Please know we welcome your feedback, whether positive or negative and recognize we work within a highly competitive and constantly changing industry. So please tell us if we didn't get it right but also if we did! We look forward to serving you soon!